Jukebox enthusiasts know the name Seeburg, a company which, in addition to producing other items over its long history, manufactured coin-operated vinyl record phonographs from the 1930s through the 1970s. The company has long since folded, but Seeburg jukeboxes are for sale on secondary markets and many homes and businesses still have one. Seeburg jukeboxes may develop problems with either the mechanism or the read-out. Play a record to start troubleshooting a mechanism problem. 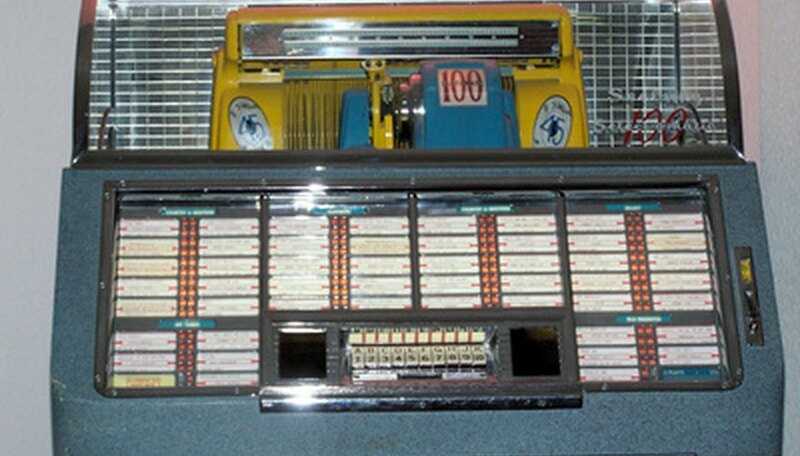 The Seeburg jukebox may scan the information and play the song, but then put the record back in the magazine. It may also play the song again, reject it, skip the song altogether or stop completely. Turn the power off and open the jukebox. Remove the motor, cartridge, switch, memory unit and the mechanism trip solenoid, which activates the scan-to-play function. Remove any obstructions and clean the unit using a water-based degreasing agent. Dirt and grime that builds up over time can prevent the mechanism from working properly. Clean the safety plunger, which keeps the record from being damaged as well as protecting the mechanism from a warped record. The safety plunger is attached to the back of the carriage. If a record is warped, this will prevent the plunger from guiding the record back into the rack. If the plunger is dirty, it will stick instead of moving freely. Determine if the read-out is working properly. Turn off the jukebox, disconnect the mechanism and remove its cover. Move the magazine to one end of the unit and remove the records. Connect the ohmmeter to the detent timing inductor switch. Rotate the turntable to see which direction it moves, then check to see if the carriage is moving the same way (the movement depends on the jukebox model). Adjust the read-out function if the direction of the carriage movement and transfer arm head is not centered on the magazine record separator. Refer to the user manual for your particular Seeburg model to identify and locate the parts and components on your model.